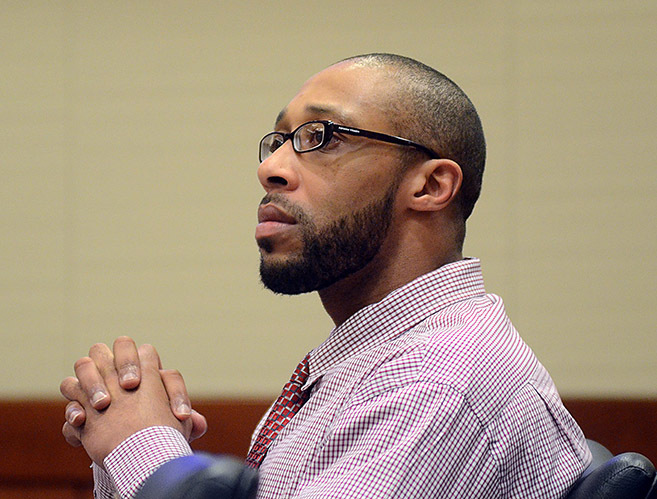 City man with ties to notorious family testifies in Shaheed Brown retrial | Homicide Watch Trenton | Mark every death. Remember every victim. Follow every case. A city man with ties to a notorious Trenton family said Monday he was headed to a weed-filled lot to relieve himself when a Ewing man was gunned down outside a troubled city bar. Wearing a green prison jumpsuit, his hands shackled in front of him and his hair in tight cornrows that exposed parts of his scalp, Raesean Sutphin, 21, told jurors that he saw Shaheed Brown as he rounded the corner from a vacant lot after hearing gunshots. Brown is being tried a second time for murder after his initial trial ended last year in a hung jury. Sutphin, the brother of slain Rodney Sutphin, did not see a gun in the former Newark gang member’s hand — or in anyone’s hand — as he peered toward the area where Enrico Smalley Jr. was shot six times, including twice in the head, near a white SUV parked in front of the bar. “I was going to take a piss,” said Sutphin, who is one of four people who was arrested and charged with attempted murder for an unrelated October 2014 shooting that injured two city residents on St. Joe’s and Girard avenues, about a half-mile from La Guira Bar. After the jury was dismissed for the day, Judge Andrew Smithson denied a motion from the defense for a directed verdict that relied on Sutphin’s testimony. Smithson said there was ample evidence for the jury to consider whether Brown shot Smalley. He felt Sutphin’s testimony did little to bolster Brown’s third-party guilt defense, implicating Alvie “King” Vereen, one of the men who accompanied Brown to the bar. In fact, Smithson remarked outside of the jury’s presence that Sutphin’s testimony about being toward the back of the vacant lot, which sits between La Guira and row homes, at the time of the shooting was “bizarre” and unbelievable. The judge said Sutphin, who pointed himself out on surveillance wearing a bucket hat and walking in front of Smalley and Brown moments before the shooting, did not have time to get to the lot. Sutphin’s brother, Rodney, was also at the bar the night of the murder, although he told detectives otherwise. Rodney, who was gunned down about three months later, was never confronted about the lie. Raesean Sutphin was with a friend, “Juice,” shortly before the shooting. Testifying as one of three defense witnesses, Sutphin said he had known Smalley for about 11 years prior to his murder. Sutphin did not know Brown, who did not to testify in his own defense, prior to him being charged with Smalley’s murder. Sutphin saw a tall African American man with his hair pulled back standing with Smalley near a white SUV. While he was urinating, Sutphin heard gunshots and crouched down to ensure he wasn’t being shot. When he re-emerged he saw Brown but did not see a gun in his hands. Authorities did not recover the 9 mm handgun used to kill Smalley. Prosecutors rested their case Monday morning after calling eight witnesses, including State Police Detective Joseph Itri, who last week guided jurors through surveillance tapes. The surveillance footage from La Guira and Ann’s Place, city bars within walking distance of each other at the intersection of North Clinton Avenue and Poplar Street, did not capture the shooting but depicted Smalley’s final moments, before he stepped off camera with Brown prior to gunfire erupting, sending patrons spilling into the streets and huddling inside the bar. Itri testified that surveillance footage, obtained from Ann’s Place, showed Brown “manipulating a dark-colored object” about three minutes before Smalley was shot. The camera was posted on a lamppost across the street from the bar, and it was dark outside, making it difficult to determine if Brown had anything in his hands. Closing arguments are expected to start Tuesday at 9 a.m.